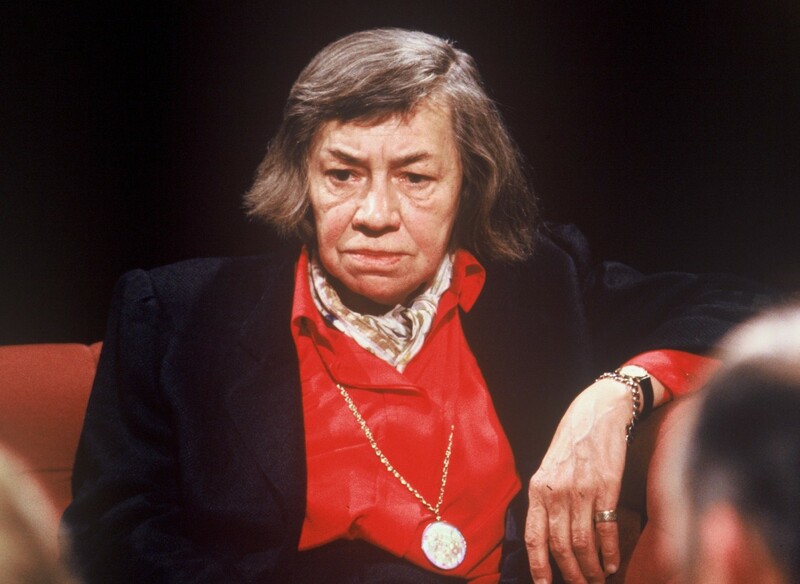 Patricia Highsmith on After Dark, 1988. Photo: Open Media Ltd.
You don’t agree with George Bernard Shaw’s idea that the artist is very close to the criminal? I can think of only one slight closeness, and that is that an imaginative writer is very free-wheeling; he has to forget about his own personal morals, especially if he is writing about criminals. He has to feel anything is possible. But I don’t for this reason understand why an artist should have any criminal tendencies. The artist may simply have an ability to understand … I would much rather be an entertainer than a moralizer, but to call murder not a social problem I think is ridiculous; it certainly is a social problem. The word existentialist has become fuzzy. It’s existentialist if you cut a finger with a kitchen knife—because it has happened. Existentialism is self-indulgent, and they try to gloss over this by calling it a philosophy … I once wrote in a book of mine about suspense writing, that a criminal, at least for a short period of time is free, free to do anything he wishes. Unfortunately it sounded as if I admired that, which I don’t. If somebody kills somebody, they are breaking the law, or else they are in a fit of temper. While I can’t recommend it, it is an awful truth to say that for a moment they are free, yes. And I wrote that in a moment of impatience, I remember distinctly. I get impatient with a certain hidebound morality. Some of the things one hears in church, and certain so-called laws that nobody practices. Nobody can practice them and it is even sick to try … Murder, to me, is a mysterious thing. I feel I do not understand it really. I try to imagine it, of course, but I think it is the worst crime. That is why I write so much about it; I am interested in guilt. I think there is nothing worse than murder, and that there is something mysterious about it, but that isn’t to say that it is desirable for any reason. To me, in fact, it is the opposite of freedom, if one has any conscience at all. Highsmith had a famously torturous personal life: she lived in isolation, drank to excess, and strained to cope with her feelings for other women. She never married, and none of her affairs lasted long. She had a habit, Schenkar notes, of “repeatedly seducing her lover’s lovers—and those lovers’ lovers as well. Persistently, I have the vision of a house in the country with the blond wife whom I love, with the children whom I adore, on the land and with the trees I adore. I know this will never be, yet will be partially that tantalizing measure (of a man) leads me on. My God and my beloved, it can never be! And yet I love, in flesh and bone and clothes in love, as all mankind. Highsmith, for her part, does not seem shocked.